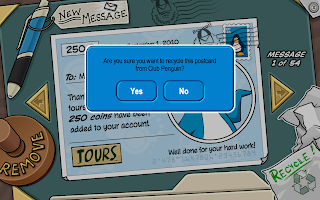 Club Penguin Cheats by Mimo777 Club Penguin Cheats by Mimo777: Club Penguin Recycle Mail Glitch FIXED! 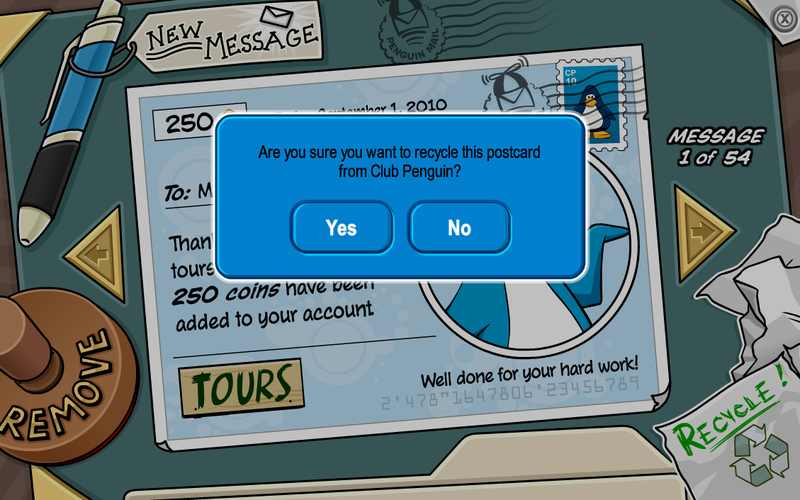 Remember when we told you about the postcards not Recycling? If not, you can read it here. Play NEW VIRTUAL WORLD! Sqwishland! YAAAAAAAAA! That glich happend to me! It waz cool! but now tis fixed thx mimo! Mimo, sorry I haven't modded for a while. I've been really busy with school. But now it's school holidays for me so I'll try to mod every day. Starting... NOW! YAAAAAAAAA! That glitch happened to me! It waz cool! but now tis fixed thx mimo! YAY! I'm actually really glad because I couldn't recycle the lame postcards that I got. I like to keep a collection of seasonal ones though. Has anyone noticed the tactical section on the EPF gadget screen? And the little animation that shows the upcoming stuff on the EPF screen? try to stay on subject but when mimo talks about tell us. i cant wait to hear. lol anyone ever heard this before? "waddle around and eat new friends"? Good for you! But please try to stay on subject. removing is better, it removes all cards from that player. Ya actually I think that Mimo posted about that awhile back. Thanks for noticing though! Darn. now i cant watch them fall down the stairs like slinkies! Please UNfix the glitch again. i liked it. lol i have 3 red face paints 2 green 3 blue and 3 red because i got cp game day! Hoooooooray! That Glitch is so annoying! But now it's fixed! Yippee! P.S. I'm the same penguin who made the first comment on the post that talked about this glitch. I'm so happy! I'm glad it's gone! That was annoying! =) But yeah, thanks Mimo and Indiana for telling us about it! Sweet! Congratulations! I hope you do a good job of conquering the island! That's a good idea. I should start collecting them to remember all the old times! :) Thanks Sprocket! Yeah, we have! Nice job noticing though! Whoa! You must be really old... in a good way! Keep those to look back on one day! Neither did I... I don't usually recycle my postcards. =O I'm a bad person! I have to recycle to save the planet! Hey, nice job! Mimo has so many commenters it's hard to be the first! I've only done it a few times! That's weird! Hehe... I have an idea! *steals time machine from G, goes back to beta party, takes 45 party hats* OK! Who wants one? oh wait in the epf room -indiana742 P.s Whoa! i heard tht before. a lot of ppl are saying that tht.